This article first appeared in the St. Louis Beacon: BAHIR DAR, Ethiopia - It is Saturday, market day, in this regional capital an hour’s plane ride northwest of Addis Ababa. The road from the airport to the university is crowded with farmers walking their goods to market. Villagers in traditional dress veer to the side of the road to avoid our car. Some drive small herds of sheep or goats. Others lead burrows and donkeys loaded with firewood or bags of charcoal. Men carry a sturdy, 6-foot-long stick over one shoulder to leverage bundles of goods attached at end of the stick behind their back. The city of about 130,000 is poor. Little girls sell gum outside our hotel. Farmers drive herds of goats down the street. Women wield long palm leaves sweeping the litter and dirt out of the gutter (left). The cleaner streets and the city’s setting on Lake Tana, at the source of the Blue Nile, make the poverty here somewhat more palatable than in Addis Ababa, the nation’s capital. The university doesn’t have the imposing buildings of an American university. The buildings are small and ill-equipped. At times, the smell of urine filters into our meeting room from a nearby bathroom, a unisex facility consisting of a hole in the floor patrolled by a squadron of mosquitoes. The Internet made it to a couple of spots on campus recently, but a Chinese road crew cut the cable. Most afternoons the electricity shuts off for hours. Students, mostly in Western dress, walk between classes in small groups like any college campus. But here, the men walk with the men and the women with the women. It’s thought to be inappropriate for a boy to walk with a girl unless she is his girlfriend. Men often hold hands and women put their arms around each other. When I first saw this in Africa, I naively thought there must be a lot of gays here. Actually, the Africans I’ve met are hostile to homosexuality. Six journalists in our workshop work for Ethiopian News, the government news agency. This isn’t unusual. The press is controlled by the government. The Ethiopians News reporters say they don’t have enough resources or air time to adequately cover the news. One of the more outspoken workshop participants asks dryly why, given the shortage of air time, they have rebroadcast over and over a program celebrating the anniversary of the current regime coming to power. Some of the journalists chuckle quietly. Ethiopian journalists look back fondly on the weeks before the 2005 election during which there was open debate and greater press freedom. The opposition surprised the regime in the election and thought it had won, a set of events similar to the 2007 election in Kenya and the 2008 election in Zimbabwe. The opposition organized street protests, and government forces responded by firing on the crowds and locking up thousands of opponents. The government shut down 14 newspapers, which accounted for a circulation of about 400,000 copies, leaving only a government press. The editors of the papers were charged with publication of false information, incitement of ethnic hatred and libel. Sixteen of the journalists were charged with treason, genocide and attempts to subvert the constitution, charges potentially carrying the death penalty. Markos Mecuria, a bright young instructor at the university, remembers how hopeful he felt in the weeks leading up to the 2005 election. Politicians and the press actually were debating policy for the first time in Ethiopian history. On the way back from tea, he says he is not optimistic that the country will return soon to this level of freedom. The government has successfully divided the opposition by exploiting tribal divisions. Markos and most of those at the workshop are Amharas, the tribe of one-fifth of Ethiopians and the ruling class during the reign of Halle Selassie from 1930-74, and the Derg, who seized power from Selassie in 1974 and governed until 1990. The Derg presided over a disastrous period of famine, civil war and summary executions, known as the Red Terror. The current regime, headed by Prime Minister Meles Zenawi, took power 18 years ago. It is dominated by Tigrayans, a small northern tribe. Amharas formed the majority of the opposition CUD party in the 2005 election. Markos says that the current government divides the opposition by reminding Ethiopians of the Amharas’ role in the Derg and the Red Terror. Even if Markos yearns for more democracy and freedom, he is a strong nationalist who deeply resents the negative spin that he thinks the Western media put on his country. A recent story in The Economist angers him. To me, the piece looks like remarkably good journalism. This isn’t parachute reporting. The reporter has traveled all around the country and devoted a large part of the story to positive developments. But Markos and most of the others in our workshop resent that the beginning of the story is entirely from a western perspective, focusing on Ethiopia as America’s strategic hope in eastern Africa because it sent troops to Somalia to drive out Islamic fundamentalists. Even more irritating to Markos is a line about how the country “has been out of step” with the rest of the world because it still follows the Julian calendar, making it seven years behind the rest of the world. It may be that Ethiopians take too many holidays to be prosperous, Markos allows, but it has nothing to do with the Julian calendar. The next graph is more upsetting. Noting that Ethiopia is unique in Africa for never having been colonized, the Economist reporter adds this is “a curse as much as a blessing.” Instead of decolonizing and modernizing after World War II, Ethiopia remained stuck in feudalism, the report says. Markos objects. He is proud that that Ethiopia resisted colonialism. He compares Ethiopia favorably with neighboring Kenya, which was under British control. I ask if he’s had a chance to compare booming Nairobi with stagnant Addis Ababa. He sidesteps the question by proudly pointing out that Ethiopian Airways has black pilots. This same worldview leads Markos to sympathize with Robert Mugabe who led Zimbabwe’s drive for independence. Now Mugabe is refusing to abide by recent elections, charging a political opponent with treason and kicking out international food agencies so that he can use food as a political weapon – or so the Western media say. Markos isn’t convinced. He thinks Mugabe has a point when he says it’s his old colonialist enemies who want him out. The workshop participants also are upset by a recent BBC report that the United Nations fears that drought in eastern Ethiopia threatens up to 6 million children with starvation. The government has denounced the report, and the workshop participants are inclined to believe the government over the U.N., which they think exaggerates to bring in food donations. Why, one journalist asks, don’t the Western media tell of the new hydroelectric facilities that the country has built to enable it to produce so much electricity that it can export some of it? I note that the fantastic new electric generating facilities don’t seem to be working too well this afternoon, since there is no power. The workshop participants laugh. In the evening after the workshop, we go over to Markos’ apartment along with Mesfin Awoke, the professor who has helped organize our stay. It is a small, clean, one-room apartment off a dirt alley. Chickens are running around in the courtyard. We’re here for the traditional coffee ceremony. Mesfin’s girlfriend, Lela Alemayehu and a friend of hers are in traditional dress roasting the beans. either Markos nor Mesfin move a muscle, even though I kid them about their chauvinism. There is no rushing this process. It’s the opposite coffee experience from the rushed Starbucks ritual in a.m. America. Roasting the beans takes about 45 minutes. Then Lela takes the beans outside and grinds them by hand. After brewing the coffee, the young women serve it to everyone, along with a bowl of popcorn. The coffee makes Starbucks taste like instant. Coffee ceremonies are important to community life. People gather with the neighbors to relax and discuss events in the village or neighborhood. Some groups working against AIDS have been trying to get their messages across during coffee ceremonies. We discuss Markos’ plans to get married. 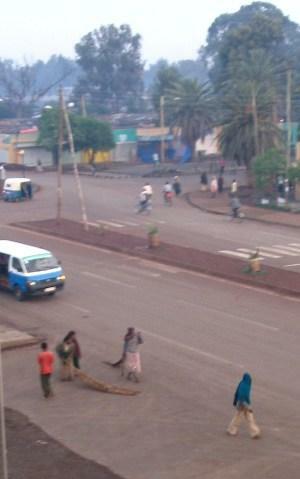 His girlfriend is in Addis. Traditionally, weddings are elaborate family affairs. Marcos doesn’t seem to be contemplating one of these traditional weddings. For one thing, he doesn’t have the money. He is paying for his girlfriend to take an accounting exam so she can get a good job. After the coffee ceremony, we go out on the town to a couple of tiny neighborhood bars. Mesfin’s girlfriend and her companion have abandoned their traditional dresses for tight jeans. In these tiny bars – about the size of the Geyer Inn if you are from my hometown of Kirkwood – 20-25 people sit around a dancing floor where a woman in a white dress performs a traditional but provocative dance to the accompaniment of a man playing a one-string instrument. The dancer shakes her shoulders, which makes some other parts of her body shake as well. The patrons are mostly men. Occasionally, one gets up to dance with the woman for a few minutes, also shaking his shoulders. Then he’ll usually hold some money in front of her forehead and give it to her. One of the dancers reaches out for my hand. I demur. It’s not Las Vegas, but I don’t feel comfortable either. Anyway, I can’t dance, even it just means shaking my shoulders. Jan, my outgoing colleague, redeems us, dancing an energetic version of the shoulder shake with Markos. Everyone is delighted.